Kate Belgrave’s piece on Monday, Jesus. H. Christ. Rides. Again, refers to the “Jesus freaks” in Brown’s Cabinet and asks why followers of God still get airtime in politics and press. Kate’s piece well illustrates that many people – particularly those who take a left of centre approach to politics – either ignore or at least fail to acknowledge the power of faith in people’s lives. With debate raging about the Embryology Bill, veils, faith schools and social cohesion, I wonder if it isn’t time for those who espouse the “progressive” agenda to debate just how to reconcile faith with our modern, pluralistic democracy. The reality of political engagement is that we have to meet people where they are – even if we do not agree with where they are. If, as a progressive movement, we are to communicate our hopes and values in a way that is relevant to the lives of others, we cannot abandon the field of religious discourse. 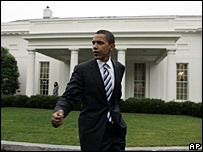 In his speech, Obama argued that secularists are wrong when they ask believers to leave their religion at the door before entering into public debate. Indeed, he makes the case that the majority of great reformers in American history – he cites Abraham Lincoln, Dorothy Day and Martin Luther King – were not only motivated by faith, but repeatedly used religious language to argue for their cause. Democratic engagement makes demands of religious believers. It demands that those who are religiously motivated act to turn their concerns into universal, rather than faith-specific, values. Democratic engagement demands that the values espoused by people of faith be subject to argument and debate. For example, if I am opposed to abortion on religious grounds and would seek to see the time limit for abortions reduced from 24 to say 20 weeks it is not sufficient to simply invoke the teachings of the Catholic Church to support my views. I will also need to explain why abortion violates some strongly held principle or set of values that are accessible to people of all faiths and none. Politics, and in particular democratic politics, involves the art of compromise, the art of what’s doable, what’s achievable and what’s possible. For some people of faith this is the greatest challenge that living in a democracy raises. For some people having faith is having certainty, what matters is not what can be done given the circumstances, what matters is not pragmatism but principle. Therefore what is needed is a sense of proportion and a willingness to engage openly and fair-mindedly. The doctor described himself as a committed Christian who understood his own beliefs to be “totalising”. His faith had led him to a strong opposition to abortion and gay marriage. But the reason the doctor was considering not voting for Obama was not simply the would-be senator’s position on abortion. Rather, it was because he had read an entry that Obama’s campaign had posted on his website, which suggested that he (Obama) would fight “rightwing ideologues who want to take away a woman’s right to choose”. This had a profound effect on Obama. Re-reading the doctor’s letter he felt a pang of shame. He wrote back to the doctor thanked him for his advice and the next day he changed the language on his website to state in clear but simple terms, his pro-choice position. According to Obama it is people like the doctor who emailed him who are looking for a deeper, fuller conversation about religion and politics. The doctor represents many (possibly a majority) who may not change their positions on issues such as abortion, the death penalty or gay rights, but are willing to listen and learn from those who are willing to speak in fair-minded words. This is a guest post. Mike Ion was Labour PPC for Shrewsbury in 2005. He blog is http://mike-ion.blogspot.com and for Comment is free. This is an interesting article and has a great deal of relevance to American politics. But how relevant is it to UK politics? I ask because there is very little evidence that Britons vote in accordance with religious outlook. A long time ago the Church of England was the Conservative Party at prayer. But with so few attendees the Church of England has very little political clout. Indeed the largely pragmatic nature of religious debate in policy making, along with the public’s indifference to such matters, suggests the UK is relatively comfortable with the much diminished role of religion in debate. Internet blogs have opened up a vicious debate between god botherers and god botherer botherers. But both are so marginal in influence that is seems little concern for the left. Even taking the case of cloning in the UK. There is no ground swell of movement against the pragmatic decision to let science progress. The Daily Mail issues scare stories, and even their readership weighs that against an uncle with Alzheimer’s. And policy reflects that despite no doubt strongly held religious views among a small number of politicians. So is there really any debate to be had in the UK? Sometimes I get the feeling that there are those just itching for a culture war in the UK. I can’t see it happening in the same manner as the US tbh, and rightfully so. For example, if I am opposed to abortion on religious grounds and would seek to see the time limit for abortions reduced from 24 to say 20 weeks it is not sufficient to simply invoke the teachings of the Catholic Church to support my views. Well quite, but it often feels like some people do use the “it’s wrong because God says it is”. This has (at least) 2 problems: (1) if I believe in God (which I do, incidentally), I might not agree that God says what you say he does (this is often the case), in which case this isn’t a good argument, and (2) if I don’t believe that God exists, then why should I care what you think he thinks? Ultimately, people tempted to use this argument should probably step back and consider how to make the argument from first principles; if it turns out you can’t and the only way of putting it is “God says it’s wrong”, then I am happy for you to say so, but you should realise that that is an argument that is unlikely to convince anyone to change their position. Fine piece, though. This is exactly the sort of ongoing analysis of perspective that LC shuld be engaging in. Hope to see more writing from all angles. I agree, and I think the point is that, as Jono said above, simply invoking God to limit access to women is not something I or many others are willing to accept. Faith can be a reason for good or bad, and we’re not taking an overall position on LC… after all Simon Barrow from the Christian thinktank Ekklesia will be writing for us. I guess its how about how the argument is invoked. Ruth Kelly et al don’t have arguments. Nadine Dorries just engages in outright dishonesty. The trouble is that here in the UK we have been turned off by zealous language in some camps to such a degree that we’ve forgotten that those speaking about the ultimate authority of God and why we sinners should follow his will are not necessarily the majority of religious people. Equally, on the other side, people faith in power or of sufficient standing don’t do themselves or their kin any favours when they start explaining things with religion. I’m with Margin4Error on this though, until the occasional outbursts of religion to explain or fight for political means increases to being frequent, as it is in the US, we don’t really have that much to debate here. If we do have anything to debate it’s about how we can stop the liberal-left from purposefully cutting off support from Christians because of the attitudes we convey, much like the example of Obama and the doctor. Jonathan Derbyshire on this subject. Also worth listening to what Mary Warnock has to say about it. to be fair – the left seeking to restrict support religion is as much a fringe in the UK as is the religious motivated clan. Margin4error says: “there is very little evidence that Britons vote in accordance with religious outlook.” I should say that many Roman Catholics do and most Muslims do. Or, to be more accurate, they vote for the parties and candidates they think are most likely to support their interests. Nothing wrong with that – it’s what we all do. Where it gets unhealthy is when religious groups seek to impose their faith-driven values on all the rest of us who don’t share them. Those of us who don’t agree with public funding for ‘faith schools’ because we believe they are socially and culturally divisive, and that children should be brought up in a wider, more diverse environment [with due provision for their preferred religious education and worship], are not anti-Christian, or anti-Muslim. We are pro-social cohesion and mutual tolerance, and don’t agree that religious or any other form of apartheid is the best way to achieve it. So roman catholics and muslims tend to vote tory because of their more conservative social outlook on homosexuality and abortion? Just over three-quarters of the UK population reported having a religion. More than seven out of ten people said that their religion was Christian (72 per cent). After Christianity, Islam was the most common faith with nearly 3 per cent describing their religion as Muslim (1.6 million). The reality of political engagement is that it’s a bad move to begin trying to get your point across by irritating three quarters of the electorate. As others have suggested though, I suspect some people are trying to import US attitudes inappropriately here. Also, whilst there is no doubt some truth in suggesting that people can be influenced by religious authorities it is also true that, for instance, there are many non-churchgoers who agree with the stance taken by some churches on abortion. Nurses, for instance, who see the effort and commitment that goes into keeping an early pre-term baby alive and the anguish of the parents; any couple that has experienced a late miscarriage may well feel uncomfortable, to say the least, at talk of abortion on demand. I have sincere doubts about that census data. A declaration of Christian faith that is backed up by what? Non attendance? It seems to me to be a ridiculous question, answered in an incomprehensible way. It may well be that folk see themselves as culturally Christian, what’s not to agree about most of the ten commandments? (Although personally I’ve always failed on the coveting my neighbours handmaiden question. These handmaidens are so hot!) It seems to me to be more of a cultural rather than a religious conceit. My point, for what it is worth, is that this is largely an agnostic society -highlighting ‘agnostic’ rather than ‘atheist’ – not a religious one. Which seems to me to have been the arguement over the last couple of hundred years. I am unimpressed by politicians who are unable to come up with a comprehensible policy on a subject without a retreat into some sort of mumbo jumbo. Nadine Dorries comes to mind. Which, strangely enough, gives me scope to not be particularily keen on abortion, which I think is morally wrong, and keep my mouth shut, on the grounds that it is not me that is carrying the foetus. I’d quite like science to come up with a solution to this, for instance that women actually took the pill when they were screwing around, rather than aborting afterwards. It seems to me that this would be less psychologically damaging. To them, I mean. Apparently, according to an article in last weeks Observer Magazine, which I can’t find on line, those that are involved in keeping kids alive that have been born grossly premature get quite upset at the anti-abortionist’s taking them on as part of their case. Indeed few, apparently only one, of these kids is likely to have a reasonable future. It is not that simple. The reality of political engagement is that we have to meet people where they are – even if we do not agree with where they are. That’s only true to a certain extent – we can only people ‘where they are’ under certain ‘rules of engagement’ and it there that the problems begin to emerge because their idea of what should constitute those rules and mine may be very different. This is where we get in questions of ‘respect’ for religion and religious belief – I can happily respect someone’s right to believe what the like even if I consider it to be manifestly absurd and irrational. What does fly for me are those – too common – occasions where what is meant by ‘respect’ in their view is the proposition that I should accept the validity of something just because its what they believe. That’s where we part company because belief in itself is not a justification for anything – it can be a short-cut to something that can be justified (or at least argued for) in rational terms and that I can respect – in regards to religion, pretty much everything it has that is of value can be backed up without recourse to ‘God says so’ – and it would also be true that if a proposition is made which I personally accept, knowing my own reasoning, I’m unlikely to be overtaxed with wanting to someone to demonstrate their reasoning before I accept what they have say, but it doesn’t follow that they have no reasoning, only belief, that I’m actually accepting the validity of the belief itself. Let’s face it – the backlash (if there is one) against God is entirely attributable to the Christian fundamentalism of Bush and Blair. We tried indulging these people and look where it got us. you do know that Blair’s christian fundementalism saw him open up numerous non christian faith schools, liberalise cloning and stem cell research, and effectively create gay marriage under English law? As a firm atheist, thats the sort of christian fundementalism I can live with. @ Pete, that census data is skewed by a very poorly worded question designed to inflate the figures. In my old job, finding out which of my partners were religious was actually useful (I hosted language students in local homes, had a register of 400+ families each year), as I would get requests from students to stay with a family of the same faith. First time I asked the question, about 70% of respondents said they were CofE. This was no good to me, the next year I asked if they attended church weekly. The number plummetted to less than 10%. Given that the demographics are skewed towards retired couples and similar, that’s an interesting number. YouGov did a survey last year asking both what your background was and whether you believed. The censu essentially asks your background, many people say they’re “Christian” or “CofE” but aren’t actually practising and are essentially undeclared agnostics. Studies done by various polling organisations that asking about actual belief and actual attendance put the proportion with any sort of faith at about 30-45% depending on question, the majority aren’t religious according to most sane data I’ve seen. It may be a small majority or it may be a large one, that has yet to be determined, but don’t go by the census numbers, they’re asking the wrong question and getting the wrong answer. How is that poorly worded? Where is the reference to background? And and how does it inflate the figures? Often people don’t read to the bottom of the list, but if that’s a factor here then it’s ‘None’ that would be inflated, surely? Mat – I don’t know where to start. There are many Christians who would describe themselves as agnostic – if it’s important to label people, then you can stick that one on me. There are even priests who wouldn’t object to being called atheists – check out the Sea of Faith Network or read some of Don Cupitt’s work. If, as I suspect, ‘practising’ means ‘attending church’ then again, yes many Christians would agree they rarely go to church. These people all believe themselves to be Christians. You obviously don’t and in my liberal sort of way I accept that. I suspect you take a fundamentalist position, believing that to be a Christian you have to believe in a personal God, take the Bible as literal truth and attend church. Very few Christians in the UK are fundamentalists. You may think like that – but most Christians don’t. Those who yearn for ‘Old’ Labour are actually yearning for a return to values that come directly from Christianity. When asked if he believed in Christianity, Clem Attlee said: “The ethics, yes – not the mumbo-jumbo. Those liberals who are so quick to deride the ‘mumbo jumbo’ perhaps would do better to at least acknowledge the ‘ethics’ too. I always put down Christian almost absent mindedly up until about 2 years ago whenever asked that sort of question. It needs to be made more clear that the question has to be about what you actually believe and practice, not just what your parents “gave” you. The question is skewed because it doesn’t ask what you practice. I don’t understand – the question wasn’t about religious practice – it was about religion. Different things. If you’re saying you would have preferred a question about practice – or an additional question about practice – then fair enough. But I don’t understand how you can say the actual question, which was about religion not religious practice, is skewed. I personally don’t see how you can’t “practice” your religion and still have one. I’m not talking in the pragmatic sense of going to church like perhaps others are saying, but to actually believe the religion and have faith in it as opposed to just having it down on your birth certificate. I think there’s ambiguity there and it doesn’t help the debate. In any case, it comes back to where we started: whatever they meant by it, and whether you, I, Mat, the Archbishop of Canterbury or anybody else thinks they were correct to do so, 75% of the adult population declared themselves as having a religion in the 2001 census, 72% Christian. Whatever they meant, they meant something, and that something has political implications. I believe that the liberal left owes a lot to Christianity, that even if we’ve never been to church and had parents who never went to church, still we have grown up in a society from which we absorb Christian values and ways of thinking. Moreover, I think a lot of those values are central to liberal-left thought and that making that explicit helps in political dialogue – especially when liberal ideas and attitudes are under attack from the Christian right. For example, the ‘Golden Rule’ is accepted by most people in most cultures as a reasonable basis for morality. In conversation I might refer to that by saying “Do unto others …” – that language is Biblical, I don’t use ‘unto’ in normal speach. Maybe you can complete the quotation, I’m sure many of my friends could (I know a Sikh mate definitely can), it goes “Do unto others as you would have them do unto you.” it’s in Luke and direct speach from Jesus so it carries a lot of weight with anyone who thinks of themselves as ‘Christian’. Whatever they mean by that, words of Christ have to be at least considered before being rejected. The way the liberal left often attacks the religious right makes their followers and many who are uncommited choose between their religion and your point of view – and they will always choose their religion. It is not an effective way to debate. 44 Then shall they also answer him, saying, Lord, when saw we thee … in prison, and did not minister unto thee? And that hurt them. It was an attack they found hard to answer. From my point of view it wasn’t just smartarse rhetoric – though I guess it worked as such. Those words express a great truth to me even though I don’t belive in the devil, hell, angels or Jesus as God incarnate who will sit in judgement one day (the RR are supposed to though 🙂 ). It is a truth I have no trouble recognising separately in my politics and my religion. You know what I mean, religion prescribed by parents, and religion adopted when filling out forms simply out of habit rather than thought. I also haven’t brought political “sidings” in to the argument here personally because I think religion is completely independent to politics and should be at every level. Also.. http://news.bbc.co.uk/1/hi/uk/1043986.stm was just before the 2001 census, and goes to show that the figures you’re quoting in terms of which religion this nation “is” can only be questioned. Again, for every parent putting their religion in as Christianity there are however many children automatically getting declared Christian too. The census as a process of finding out what religion people truly are is flawed.